The TRAPPIST-1 system contains a total of seven known Earth-sized planets. Three of them – TRAPPIST-1e, f and g – are located in the habitable zone of the star (shown in green in this artist's impression), where temperatures are just right for liquid water to exist on the surface. While TRAPPIST-1b, c and d are too close to their parent star and TRAPPIST-1h is too far away, the remaining three planets could have the right conditions to harbour life. 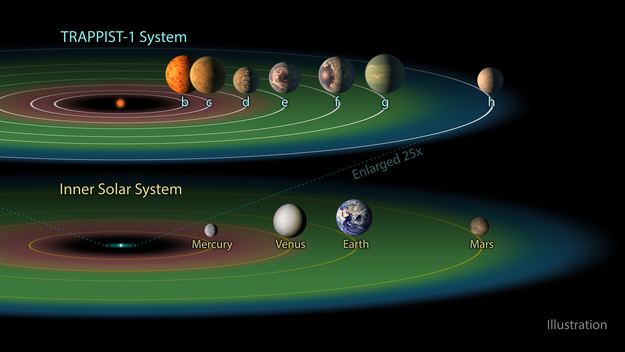 As a comparison to the TRAPPIST-1 system the inner part of the Solar System and its habitable zone is shown.